I have a greenhouse where we grow vegetables. 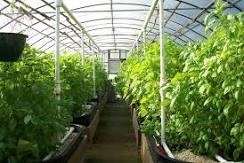 In the greenhouse there is a controlled environment – temperature, soils, air, light, water and chemical supply. Plants in the greenhouse grow very fast. This is the greenhouse effect. This is the effect abiding in Christ has on your life. Your life progresses in a controlled and protected environment when you are in Jesus. The capacity to progress and grow is build into all of us. When we don’t grow frustration sets in. Life is dynamic and organic – when it becomes static death starts. Your career, business, relationships, income, ideas, networks and net-worth should be growing. You will agree with me that if there is no growth in one of these areas it could be weighing you down. Jesus is an accelerator and enabler …He enables you to do much! I am the vine, ye are the branches:He that abideth in me, and I in him, the same bringeth forth MUCH fruit:for without me ye can DO nothing. Meditate on these nuggets as you go through the day and you will experience productivity and an endless supply of strength and resources. All stagnation in your income, business, relationships, job will cease when you know where you live – in Christ!